How well are you ageing on the inside? Lumia Spa Stirling are delighted to now be able to offer our clients access to The Pharmanex BioPhotonic Scanner. This is the world’s first measuring tool that gives you a Skin Carotenoid Score (SCS)—immediate evidence of carotenoid antioxidant activity in your body. This lets you know exactly what’s going in on the inside. 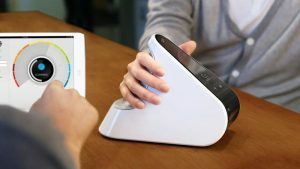 It’s not scary – by placing the palm of your hand in front of the scanner’s safe, low-energy blue light, within seconds you will obtain a reading of the carotenoid antioxidant levels in your skin—your Skin Carotenoid Scores (SCS)—which has been scientifically correlated to overall antioxidant status. This empowers individuals to make improvements to their diet and lifestyle, and helps them make an informed decision on which supplements are properly formulated to impact their antioxidant levels. Each day we are exposed to free radicals—many of the physical effects we call aging are a result of free radical damage, and no matter how healthy you try to be, you receive free radical damage every single day. They’re even caused by UV light, pollution and use of mobile phone. When left unchecked, free radical damage to your cells accumulates and can lead to serious health concerns later in life. In fact, free radical damage can cause premature aging and is a large factor in the deterioration of health over time. A visual example of free radical damage is when you slice an apple and it turns brown. This natural process is called oxidation. 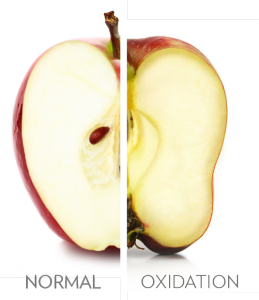 As oxygen interacts with cells of any type – an apple slice, for example-oxidation occurs. Antioxidants are your first defense against free radicals—they freely share their electrons and stop the degenerative chain reaction of free radicals. Our bodies naturally generate some antioxidants, however, new research shows additional sources of antioxidants may provide added protection against a growing onslaught of free radical invaders. 3. Supplement with the Scanner certified products, Lifepak+ and JVi. They are certified to help provide your body with an adequate amount of carotenoids. Our Pharmanex trained staff at Lumia will be able to advise which supplements are best after your scan. If after taking the Scanner certified products your SCS does not increase, your money will be refunded. Click here for details on how to book in for our next Biophotonic Scanner Clinic at Lumia or call 01786 831 164 for more information.